As much as I hate to put down Tamiya, why can't they make a proper ESC? I prefer to use only Tamiya parts and hop-ups in my builds, but when it comes time to match their motors (brushed) with an ESC, I have to look elsewhere because the included ESC can not power anything more than a silver can or a Sport Tuned. I'm a really big fan of the a Super Stock BZ and RZ motors, they perform well and are rebuildable. But TEU ESC's can not handle these for more than 5 minutes without shutting down. I guess what I'm saying/ranting about is that if Tamiya is going to make a hop-up motor available, make a matching ESC available. Maybe even offer them as a combo pack. Good idea. It's frustrating. They do make one that goes down to 23T brushed, TBLE-03, but it's £40. You can get the Hobbywing 1060 for £15 on fleabay, which is well-rated on this site and goes down to 12T. That's what I'm buying instead. The TEU-302 is great? It's just hellishly overpriced, since it hasn't reduced in cost since it was first introduced even though the technology is now 'old' and better ESCs can be had from other suppliers. It's almost like Tamiya haven't replaced the 302 since the advent of Brushless. I totally agree. Not all of us want to run brushless. Personally I'm happy with a decent brushed motor and lipos. +1 on the Hobbywing Quicrun 1060 Esc. They are awesome for the money. 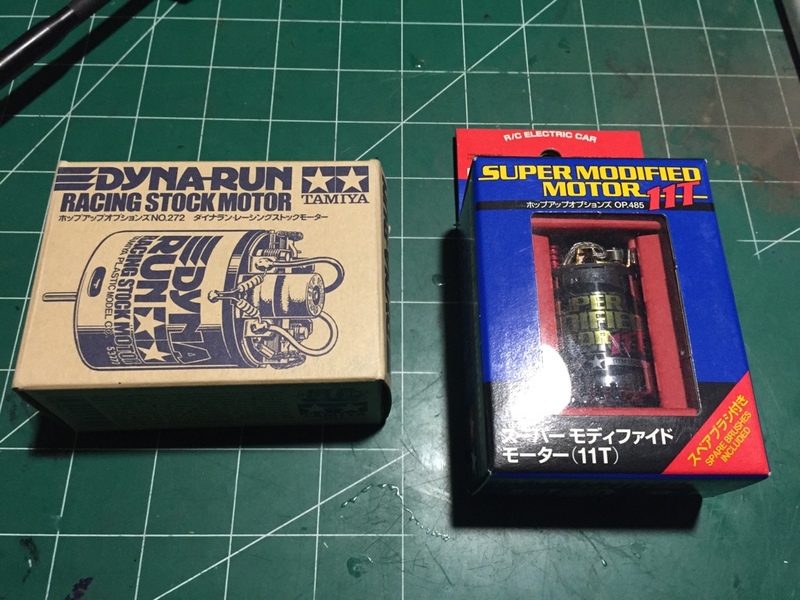 I have these two motors and would really like to power them with a Tamiya ESC. But unfortunately, I can not. So my question is, what brushed esc works with a 2s lipo, and has a wide range of turn limits? The Hobbywing esc mentioned looks good, but I need something that can go down to 11 turns for my super modified. All I see is the Tekin FX-R pro, which sells for $105 usd on RCMart. The HPI for £25 is my ESC of choice in the absence of Tamiya offering a decent turn limit or lipo compatibility. The HPI one is waterproof, lipo compatible for 2s and 3s, 12T limit on 2S, easy to set up, Tamiya plug (so you'd need a Tamiya to Deans adaptor plug if using Lipo's with it) looks great and classy. For the price it's everything I want for a brushed motor. I'm thinking of trying this out on my Dual Hunter so I can run 2 motors off it and use lipo. I think I may chance it on two Tamiya 23T motors (11.5T equiv) and see how it copes even though that would be pushing the 12T limit a bit! That's a forward only esc, and for that price, I can buy another kit. Yes, you are correct, it is a forward only ESC, because it is was designed for racing.. But then again, so are the TZ, BZ, and RZ Super Stock motors.. But to answer your original question, yes, Tamiya do in fact make a "proper" ESC that will run those motors you listed..
Maybe the question that you should have asked is "Why can't Tamiya make a reasonably priced mid range forward and reverse ESC that will run the BZ, TZ & RZ 23 turn motors that they sell??" But seeing as pretty much all of Tamiya's range of electronics is somewhat overpriced, I'm not sure that they could make anything better or cheaper than the $25.00USD HobbyWing Quicrun 1060. EDIT.. Even if Tamiya was to do a deal with HobbyWing and rebadge the Quicrun 1060 as a Tamiya, I still believe that they will cost two, maybe three times what the Quicrun sells for.. I can't see spending $40 to $60 for a motor and $500 for an esc. I wouldn't mind spending $50 to $100 for a Tamiya esc that would be comparable to the Hobbywing esc. Like I said earlier, I like to try to keep my Tamiya vehicles all Tamiya. And that Volac esc isn't practical for anything but racing. I don't think the majority of people who buy the TZ, BZ, RZ motors race on that kind of level. Some great points, I think Tamiya is just assuming everybody is using brushless and kind of gave the finger to those of us who still enjoy using cheap, non-stock brushed motors under 27 turns. The $485.00 as listed on the Tamiya USA website for the Volac is full retail $$ for that ESC.. I imagine that the street price would be somewhat less, and that is shown in the $218.00 price that RC Mart was selling them for, which in reality is not bad for that ESC in its day..
Now its just obsolete technology..
What about the Tamiya ADSPEC radios and CPR P100f and P160f ESC and receiver combo's.. I'm sure that one, if not both of those would run the BZ, TZ, RZ 23 turn motors.. I see what you're saying. But I think they should offer a TEU esc that can handle those motors. But for the 11T motor, I think I have I'll have to use the Tekin FXR-Pro. Even if Tamiya offered a decently priced 'mid-range' ESC that could handle, maybe 15-17T motors , that would make a lot of folks happy. The TEU-101-2/3/4/5 doesn't cut it for anybody who has a decently quick motor. The new esc that comes with the Tamiya kits can run sensored brushless motors. Why on earth would they regress to a brushed only esc? Honestly? They've released a brushless esc incompatible with lipos and fitted with a molex connector. Going back to brushed could hardly make less sense. What's the motor limit on my teu102 which came with my tt02 rally kit? I had hoped to run a 14x2 motor with it but get the feeling that's too much for the esc? Oh! This must be why my TL01 drifter keeps shutting down after 5 minutes.... Not sure what motor is exactly as I've had it years, but I think it's a 21T. I just assumed as it was one of the new ones that can run brushless it would cope ok. What motor should I go for then? Worth switching to brushless?!? I had the same problem with my avante I like using tamiya products for my rc's but tamiya don't do a ESC that is compatible with the super modified motor (11 turn) so I got a motroniks viper RV11 for £24 for eBay normal price £55 and its brilliant! They work with lipo, and a molex connector will work with lipos (although not the best). I think my issue is that it nicely sums up one of my pet peeves with Tamiya in general. The product is fine, but you'll have to pay more for it put in some elbow grease and buy additional bits to get it to function as well as the competition, and it's seemingly for no reason. This thread is starting to sound like a whinge, gripe and bash session about Tamiya.. I think it all comes down to economics, and what return Tamiya might get back by investing in what is essentially obsolete technology.. Quite frankly I don't think that it would be economically viable for Tamiya to make that investment especially given the limited market, and when it will be competing against companies like Hobby Wing who has released a brushed fwd/rev ESC that will handle down to a 12 turn motor for $25USD..
As for the TEU range of ESC's, I believe that they were designed for one specific purpose, and that was to be a replacement or alternative to Tamiya including a 3 step MSC in their kits to run the kit supplied 27 turn "silver can" motor..